Scholarships are a great way to earn free money for college! It's important to know where to look, best practices for the application process, and how to better your chances at being selected. Spring time is just around the corner, bringing with it blooming flowers, warm sunshine, and AP testing. One of these activities requires active preparation. With these few tips, a great score on the AP exam is within reach. The ACT is an exam with its very own unique scoring method. For this reason, the scores can oftentimes be hard to decipher. At College Nannies and Tutors, we have put together a guide to help you understand your ACT scores. The April ACT Test is Fast Approaching. Are You Prepared? With a little over a month to go, the April ACT test date is right around the corner. If you haven’t started studying, now is the time. 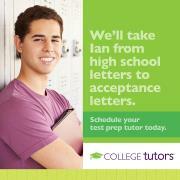 CNT offers services that can help you prepare and practice for the ACT just in time for April 12th. Here are some suggestions that can prepare you for the ACT and help you be productive with the time you have left. AP tests can be extremely intimidating. When you are thoroughly prepared, you can beat the stress and focus on the questions instead of psyching yourself out. Here are a few ways you can prepare for the AP test.